Darren at Tetrapod Zoology has a fun post about The Science of Godzilla. He points out that, while not a real critter, there has been occasional analysis of Godzilla in the scientific community. To begin with, let's get things straight and admit up front that Godzilla is not a real animal, nor was it ever. It's an unfeasibly big late-surviving dinosaur (belonging to the hypothetical taxon Godzillasaurus, according to some), mutated by radiation, with a radioactive heart, and virtually impervious to other gigantic monsters, robots, artillery, laser blasts, lava and fire. Not real. Sorry about that. But by posing questions about fictional entities we can still learn stuff, and you may be surprised to learn that Godzilla has, on occasion, been discussed semi-seriously by various biologists and palaeontologists. Read on to find out about Godzilla's actual size and strength, how it generates radioactivity, and just what kind of dinosaur it is. 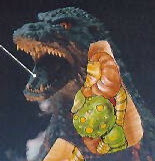 Darren also links to a very cool page on kaiju biology, with cutaway diagrams showing the anatomy of several giant Japan-attacking monsters (see the picture at the top of this post, for example). If you are a fan of "kaiju eiga" (giant monster movies), be sure to check it out." As a godzillasaurs, its great size may be the product of several factors. 2).Heart's two main functions,pulmonary and systemic circulation. 3).With out restrict armour, he could grow to a enormous size.